The Champions and Summoners of Noxus gather for a critical decision. Jericho Swain, Grand General of Noxus, stood illuminated by the pyre blazing before him in the dark stone hall. The Champions pledged for Noxus in the Mirrorwater adjudication stood in a semicircle facing Swain. Their darkened features were made but briefly distinct now and then when the flames from Swain’s pyre flickered just so. 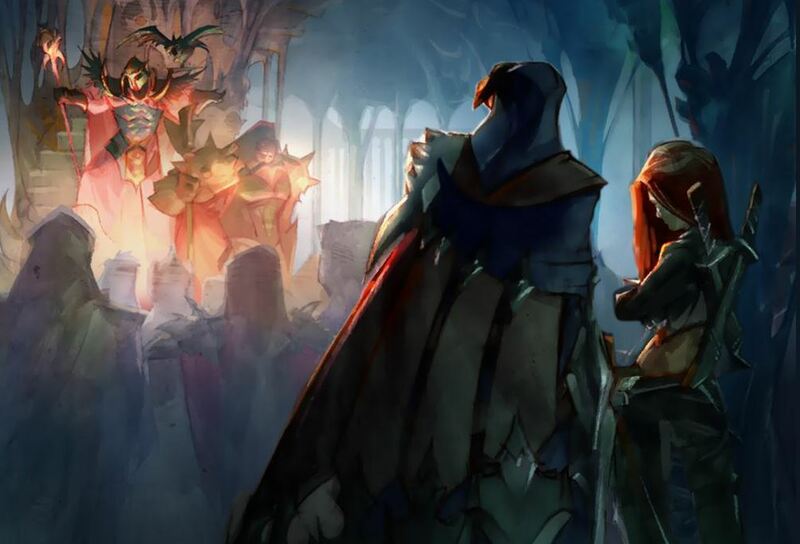 In the Noxian custom, each had a stand topped with a steel bowl in front of them, with tinderstone for striking up a flame, by their own hands and with their own strength, when they wished their faces to be seen and their words to be recognized. The Champions faced not only Swain but also, arrayed in grand galleries behind him, hundreds of Summoners in their purple robes. Each was trimmed in ash gray to represent solemn oaths of allegiance to Noxus in the Mirrorwater dispute. Visitors present at Swain’s invitation stood along the side wall, almost invisible in the darkness. Into the quiet dark came a crack of stone and a flourish of fire as Darius, the Hand of Noxus, lit his speaking-flame. His laconic introduction spoken, Darius doused his speaking-flame and faded away. Singed limbered forward from the row of visitors. Coming to the speaking-flame stand, he lifted up two vials, glanced but briefly at them to verify their contents, and popped the wax-sealed corks off with a practiced flick of his thumbs. He upended them and the chemicals splashed into the bowl. A searing white flame boomed upward, and the room became as bright as a field on a summer’s noon. Even Darius flinched and grimaced. Singed let out a low, relaxed laugh, muffled by his bandages. “I like to make a big entrance.” He spread out his arms and looked around. He tugged at a leather band holding a vial to his arm and rolled the glass off his elbow before snatching it up with his other hand, uncorking it, and adding it to the bowl. The light dimmed down to the size of an ordinary speaking-flame, though alternately purple and green in color. “You’ve all seen my work.” Singed’s bandages tugged up, suggesting a smirk. In the visitor’s section, now dark once again, a warrior’s swordhand began to shake. Riven had seen Singed’s work. The Ionians kept good formation as they approached. Riven’s mind processed the implications of their stride and appearance quickly. Veteran troops. Rested. Fed. Focused. Drilled. Her soldiers were exhausted, hungry, and disillusioned, and her fame no longer seemed enough to secure their loyalty. They were also flanked and outnumbered at least five to one. The Ionians would grant no quarter after the bombardment of Kuan Yun. Riven had signaled for reinforcements by rocket, but there had been no answer. They might all die here. As they made their last stand at their pitiful final bulwark of crates and overturned supply wagons, the reinforcements came down from the sky. A deafening boom, a wave of hot choking chemical air. The swords-and-spears battle between Noxian and Ionian ended in a heartbeat. The chemicals were the enemy of all breathing life on that field then, and within seconds the chemicals were the victors. The rest was aftermath. Soldiers, comrades, dropping their weapons, screaming and gurgling, clawing at their burning eyes, flesh melting from bone, hands trembling spastically as they withered into twisted gray twigs. Bile stung her throat. She swallowed it back. Riven breathed the cold air and tasted just a hint of the chemicals Singed had used to ignite his speaking-flame. Murder flashed in her eyes. She closed them. What is broken can be reforged. She channeled her rage inward and felt her spirit purified. When her eyes opened, they were hardened by steel-cold resolve. She walked up to a speaking-flame stand and struck it alight. Tem. He had seemed genuine. A decade ago. Was he still at Etanor? Was he still alive? Riven found Cassiopeia’s furious reaction somewhat reassuring. “A Noxian,” she countered. Katarina’s speaking-flame blossomed. “Unlike you.” She silenced her flame and vanished into darkness. “There is no freedom in Demacia.” Riven kept her eyes on Swain, like a soldier at attention once more. In her mind, Riven saw those shaking, withering hands again. As she often saw them in her nightmares. Swain paused. He stroked Beatrice along her wing. She screeched to him, and he slipped her a bit of biscuit. Swain turned around and faced the gallery of Summoners. He rested both hands on his cane. A vote was then taken among those Summoners who had declared for Noxus in the Mirrorwater dispute. All the while Swain stood impassive, letting the Summoners speak as they wished. Who knew who might pay for their blunt words later. Singed narrowed his eyes to hard slits. He said nothing, and shoved his bandaged hand into the flame. The bandages did not burn, but hot smoke and sparking embers drifted up into the air as he crushed it out in his palm and faded into darkness. Riven bowed her head. “Yes, Grand General.” She doused her speaking-flame, turned, and left. Once more she would fight for Noxus. The true Noxus. Riven, the Exile, will fight for Noxus! Riven is an honorable warrior who represents a return to the traditional Noxian values of strength and freedom and a rejection of the ruthless “victory at any cost” tactics for which Noxus has become notorious. Singed, the Mad Chemist, has been turned away … at least for now.